Most of us read Enid Blyton's books when we were kids and I did too. What wonderful tales she could spin! My favourites were the more real ones with adventures and mysteries, not so much the ones with magic and fantasy. And I think the reason was the descriptions of the suppers and teas and tuck boxes and all the goodies that would star in these descriptions - Hot buttered scones, bowls of jam, meat pies, potted meat, potted shrimp and I remember, in one book it was Christmas and Cook comes in at the end of a grand meal carrying a Christmas pudding that had been flambéed with brandy! For a kid growing up in Bombay with fairly non-adventurous parents (at least about food) most of these foods were completely alien and I guess, because it was up to me to imagine what I liked, they became even more wonderful. A few days ago K came home with a surprise for me. He had found out that a friend's mom makes potted meat and so he requested her to make some for us. Can you imagine my delight?! Here was one of those nearly mythical foods from my childhood.. not that I'd ever tasted it or even had a clue what it was supposed to look like, but still. It was way up there on my list of things I'd like to taste in this life time. 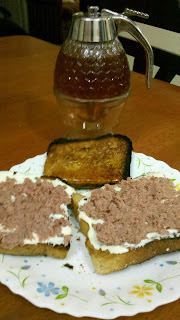 The potted meat is made using beef mince, bacon mince, shredded bread, onions and spices and is a lovely flavourful meaty paste. I've still got to eat scones.. were they any good at Tea Centre?